Article by Peter FitzSimons, photography by Oliver Oldroyd. 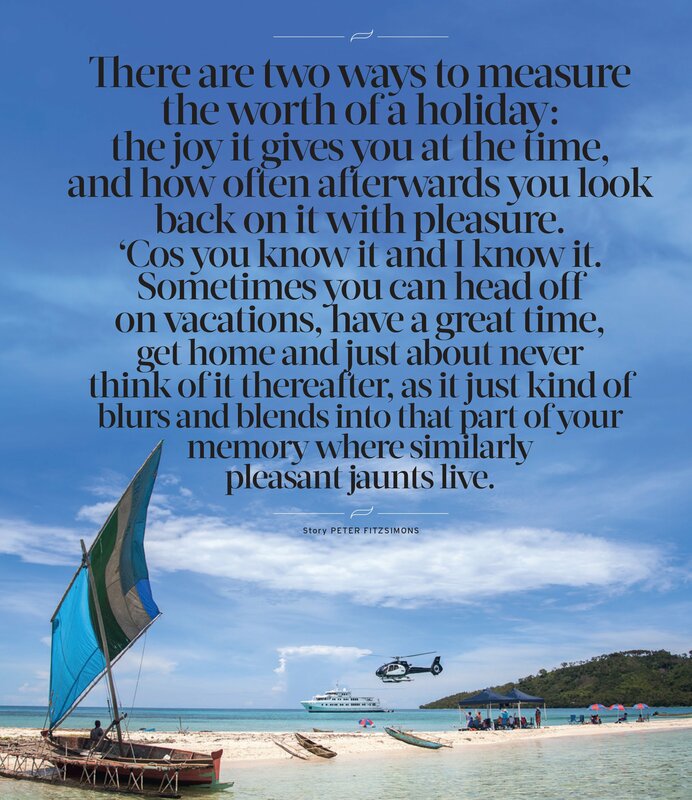 There are two ways to measure the worth of a holiday: the joy it gives you at the time, and how often afterwards you look back on it with pleasure. ‘Cos you know it and I know it. 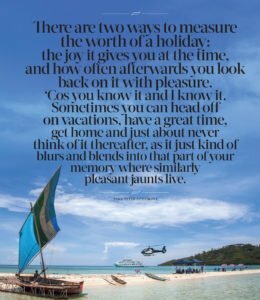 Sometimes you can head off on vacations, have a great time, get home and just about never think of it thereafter, as it just kind of and blends into that part of your memory where similarly pleasant jaunts live. The ten days I spent on True North last summer was not like that. I loved it at the time, and have thought about it many times since, for it really is an experience like no other. 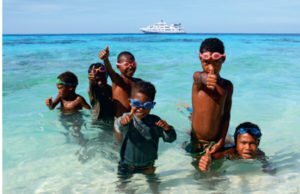 The guts of the idea was to cruise around the islands that lie to the east and north of Papua New Guinea, to do everything from going on hikes, to diving on the submerged wrecks of Japanese planes, to serious fishing and getting in the helicopter and flying over the volcano at Isurava. Look, I could be more detailed on it, I suppose, but it was one of those things . . .
As two refugees from two very brutal work years in Sydney neither my wife – a television anchor – nor I, really had time to focus on what the whole thing was about. 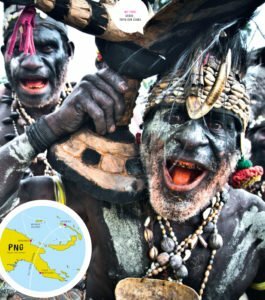 We caught a flight to Cairns, spent the night, and then flew for about 90 minutes to an airstrip in eastern Papua New Guinea where the True North awaited us. A luxury cruiser just like mother used to make, it has three decks, 20 or so cabins and at least as many very professional staff, plus a helicopter on the roof and a dining room serving five star cuisine. We never went through any major storms but it had the air about it of a ship that would easily cruise through one. I don’t have the technical lingo, and nor do I care – the point was it is more of a ship than cruiser. It was solid, very comfortable and it felt safe. The special joy of this kind of holiday of course is that instead of packing up and going to a different hotel room every second or third night, in this case it is the hotel room that keeps moving with you! 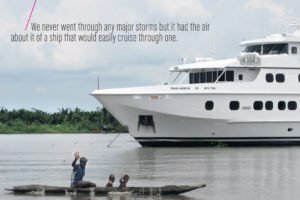 Though it took us a little while to get to know them, our fellow passengers proved to be mostly wealthy retirees with an enduring sense of adventure – meaning they had come to the right place. For awhile – still exhausted from the work year – we kept ourselves to ourselves for the first day or two, though we became progressively more aware over dinner that the others were going snorkelling and diving, visiting remote villages, fishing, and choppering on and off to exotic locations. There was no particular pressure to do likewise – I am writing a book on Fromelles and don’t feel right unless I get at least six hours a day writing in – but one thing led to another. Next thing we knew, we were in the hands of a master diving instructor, descending to the depths and . . . and . . .
And, oh . . . GAWD . . . what the HELL IS THAT? It is a shark, coming our way, a hammer-head shark. Personally, I was glad I was wearing the brown underpants that day, but our diving instructor, Matt, was beside himself with excitement. In 14 years of doing this, he’d never been that close to a hammerhead. For me, it was something I was glad to have seen once, but never again. Diving on a Japanese Zero, in shallow water, was much more my speed and it was an extraordinary thing to actually sit in the cockpit of a plane that had been brought down – maybe by my own father I fancied, as he served with the Australian armed forces in these parts – some seven decades before. 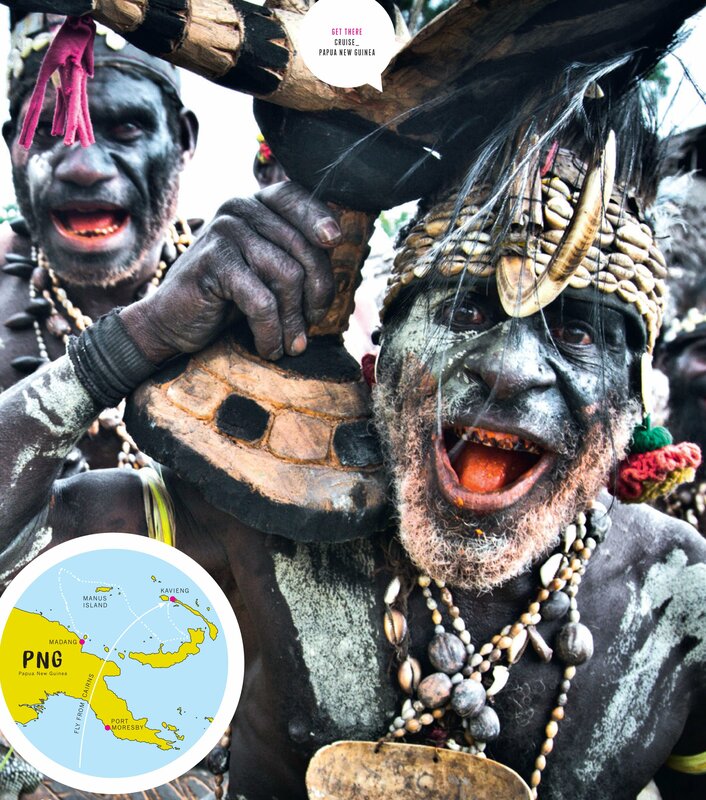 Visit the main battle site of the Kokoda campaign? Why not? The last time I had done so it had taken six days of brutal trekking to get to Isurava. This time it was a one hour chopper ride from the back of the boat, over some of the most stupendous country on earth. Last time, coming from the tight jungle, Isurava had seemed massive. This time, coming from the air, was a tiny pocket of a village in the otherwise impenetrable vastness.